Facebook founder Mark Zuckerberg stepped up to give a clear direction on where he sees the digital society going, and Facebook’s role within it. Talking about “building and creating social good”, Zuk’s comments came against a backdrop of a radically changing political climate in the USA, in what was as much a political message as a statement of corporate intent. Facebook’s CEO wrote a huge 6,500-word letter about world building and creating social good. 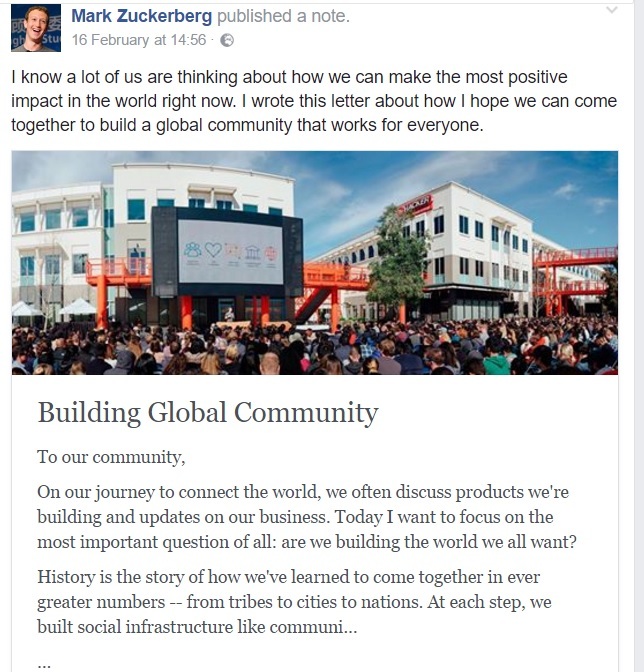 The letter, hosted on his Facebook page, outlined his plan to “come together to build a global community that works for everyone”. The 32-year-old tech billionaire asks the question: “Are we building the world we all want?” He goes on to discuss his concern over the spread of fake news. Last year the Facebook CEO finally admitted the networking site is a media company. However, rather than “banning misinformation”, the site’s new approach will be “on surfacing additional perspectives and information”. Last year, Facebook came under fire amid accusations that fake stories on the social network helped Donald Trump win the US presidential election. At the time, Zuckerberg called the claims “crazy” and rejected the idea that Facebook users existed in “bubbles” where they only see news which reflects their viewpoints. However, now the Facebook chief admits that the company has “work to do” in order to combat the “misinformation and even outright hoax” shared on the site. Despite what he called the “positive force” of the voice social media gives to everyone, he admitted it could also “fragment our shared sense of reality”. Along with his wife Priscilla Chan he has launched an initiative to wipe out ‘all disease’. He also listed five specific areas Facebook will focus on to develop “the social infrastructure for community”: support, safety, information, civic engagement and inclusion of all. He said: “It is our responsibility to amplify the good effects and mitigate the bad – to continue increasing diversity while strengthening our common understanding so our community can create the greatest positive impact on the world. 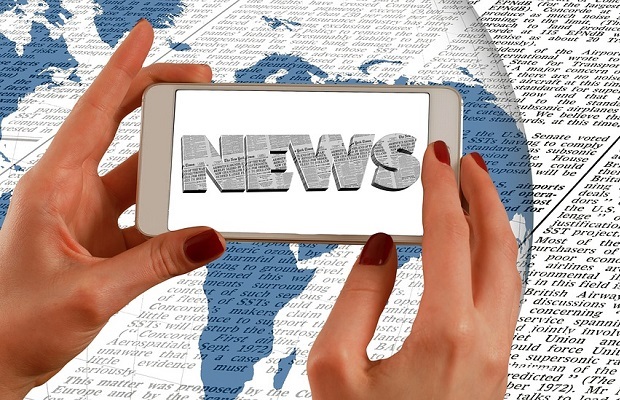 “The two most discussed concerns this past year were about diversity of viewpoints we see (filter bubbles) and accuracy of information (fake news). In December, Zuckerberg admitted Facebook was a media company, after years of claiming it was simply a technology platform. His comments come as President Donald Trump launched an unprecedented hour-long attack on mainstream US media for disseminating fake news. The post by Zuckerberg – who has more than 86 million followers – has been liked more than 52 thousand times in less than 12 hours.